Superfast connectivity and a car that’s a mobile Internet hotspot, thanks to addition of 4G LTE with built-in Wi-Fi to the standard OnStar assistance system. Giving the top-trim LTZ model more zip – on the road, that is — also is in the cards for this subcompact sedan and hatchback duo. To get the newest styling and equipment. This car came to America for model-year 2012 and is on schedule for a model-year 2018 full redesign. That suggests the 2016 version will get some appearance changes, probably a reshaped grille, front bumper, and headlights. Different cabin-surface textures and perhaps new taillamp lenses could round out the updates. Chevy probably won’t introduce major new features but could expand availability of such items as the rearview camera to the least-expensive model. If you don’t value the latest look and gizmos and care more about getting a surprisingly likable little automobile before the 2016 price increase. The ’15 almost certainly will have the same powertrains, interior dimensions, and trim levels. Long-term resale value hardly would be affected by anything planned for the 2016. But dealers are apt to offer discounts to clear inventories to make way for the facelifted models. Take advantage. Maybe a new color choice – we hear something called “Blue Velvet” will be added. Otherwise, no changes. 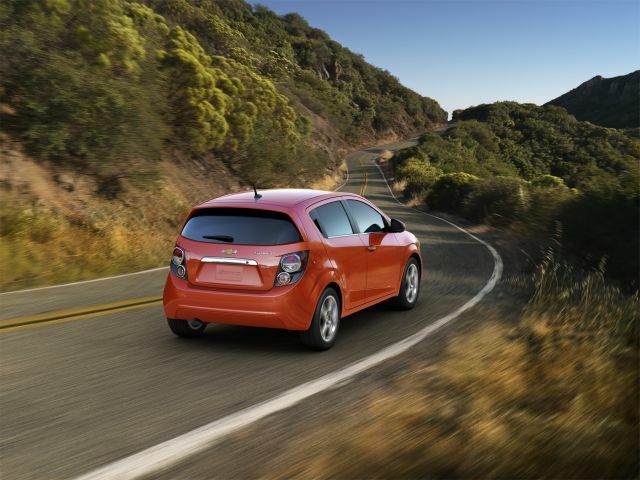 Designed in South Korea and built at a General Motors plant in Michigan, U.S.-market Sonics slot into Chevy’s lineup between the Spark minicar and the Cruze compact. Even with a facelift, the nose would again be dominated by oversized headlamps and a large grille. Both body styles share the same wheelbase (distance between the front and rear axles), but the sedan’s body is some 14 inches longer than the hatchback’s. We’re fans of the hatchback for its more unique appearance and its 19-cubic-feet of cargo volume behind the rear seat and 47.7 with it folded down. The sedan’s no luggage-hauling slouch, though; its14.9-cubic-foot trunk is the biggest of any car in its competitive set. Both have great headroom but neither has a spacious rear seat; go for the Honda Fit, Kia Soul, or Nissan Versa Note hatchbacks or the Hyundai Accent and Kia Rio sedans for that. The ’15 lineup will consist of base LS, volume-selling LT, fancier LTZ, and sporty RS models for both body styles. There’s also a tinted-trim edition of the sedan called the Dusk. Front-wheel drive will repeat and the engines will again be borrowed from the larger, heavier Cruise, for a slight power advantage over many subcompact rivals. Expect the LS and LT to again come with a 1.8-liter four-cylinder. A turbocharged 1.4-liter four should remain standard on the RS and optional on the LT – though expect it to be the new standard engine for the 2015 LTZ, as well. Both engines are likely to repeat at 138 horsepower, but the turbo will have more torque for better throttle response. All models come with a manual transmission – a five-speed for the 1.8-liter, a six-speed for the turbo – and are available at extra cost with a six-speed automatic. With either engine, these are fun-to-drive subcompacts that ride like bigger cars. Handling is more than competent, with the RS giving the hot-hatch thing an entertaining try, though it’s no Mini Cooper or Fiesta ST. All have electric power steering, a torsion-beam rear axle, and antiskid and traction-control systems. Antilock brakes are standard, too, although only the RS and Dusk versions have rear disc brakes instead of drums. Don’t expect a hybrid or pure-electric version within the next few years. Expect EPA ratings to continue around the middle of the subcompact class, partly due to the relatively powerful engines. With the base 1.8-liter, look for 26/35/30 mpg city/highway/combined with the five-speed manual transmission and 25/35/28 mpg with the six-speed automatic. With the turbocharged 1.4-liter, expect 29/40/33 mpg with the six-speed manual and 27/37/31 mpg with the six-speed automatic. 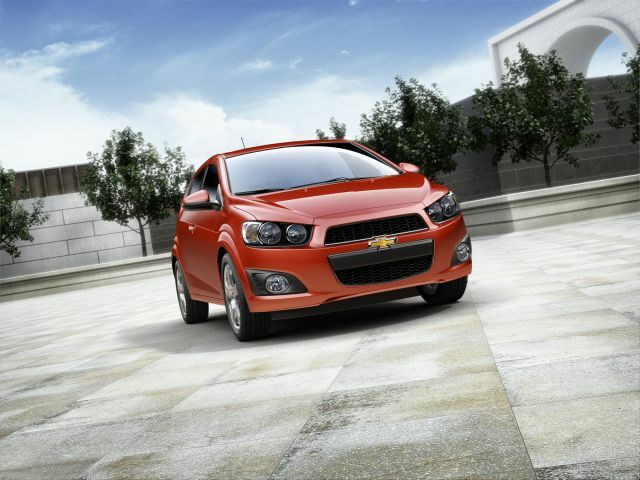 This Chevy will return with most every feature subcompact buyers expect, and a few they may not. The 4G LTE service with Wi-Fi hotspot, for example, will be part of OnStar and transform the car into a mobile hub for drivers and passengers. The 4G service speeds data uploads and downloads, while the hotspot is on whenever the car is on and comes with a three-month/three-gigabyte data trial. OnStar includes six free months of automatic crash response, turn-by-turn navigation, and MyChevrolet mobile app; subscription fees apply thereafter. Further connectivity includes Chevrolet MyLink radio. 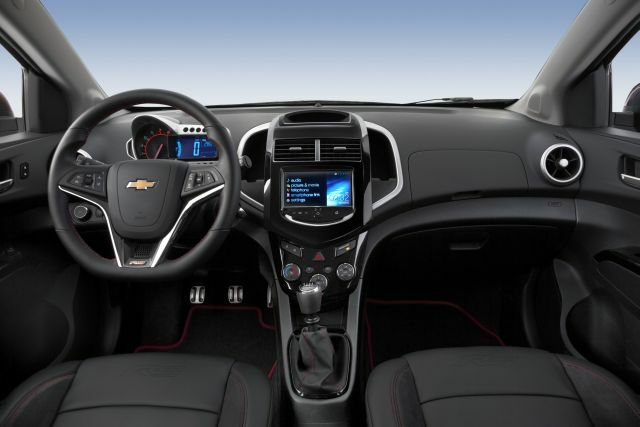 Standard on LT, LTZ and RS, it features a 7-inch dashboard touchscreen, USB port, Bluetooth streaming audio for music and select phones, voice recognition for compatible smartphones, and SiriusXM satellite radio (initial three months free). Air conditioning, a tilt/telescope steering wheel, remote keyless entry, an antitheft alarm, an outside temperature gauge, automatic on/off headlights, and variable windshield wipers will again be included in the base price. Among features uncommon in this class, look for frontal-collision and lane-departure-warning systems, heated front seats, and leather upholstery as standard or optional, depending on model. Remote vehicle start on automatic transmission-equipped LT, LTZ and RS models will return. They’ll increase slightly, but remain very competitive in this price-sensitive segment. We estimate a base-price range of $15,300-$22,500, including the destination fee of around $825. Sedans should again be priced below the hatchbacks, with the volume-selling LT listing for an estimated $16,700, or $17,000 for the five-door. To that, add $1,100-$1,300 for an automatic transmission, depending on model, and about $700 for the turbocharged engine. Among versions on which the turbo is standard, figure the LTZ to start around $18,900 and the RS around $21,000. Chevy’s MyLink smartphone integration includes compatibility with Apple’s Siri Eyes Free. It lets owners with an iPhone running iOS7 or iOS6 make voice-activated, hands-free calls to their contacts, play songs in the iTunes library, listen to and send an iMessage or text message to a saved contact. The setup minimizes distraction by keeping the iPhone screen dark, even when Siri answers simple questions, though in Eyes Free mode, Siri will not answer complex questions that require displaying a web page.